Summary: We report a case of segmental agenesis of the right internal carotid artery (ICA) in a 53-year-old woman, associated with a saccular aneurysm of the left anterior cerebral artery (A1 segment) presenting with a right hemispheric transient ischemic attack. The agenetic segment was located distal to the origin of the posterior communicating artery (PComA), as documented both angiographically and by direct surgical inspection. This observation suggests the existence of a previously unrecognized embryologic segment of the ICA, located between the PComA origin and the terminal bifurcation of the ICA into the anterior and middle cerebral arteries. The internal carotid artery (ICA) in its adult form can be seen as a succession of arterial segments that lead from the carotid bifurcation in the neck to the intracranial ICA termination (Fig 1). 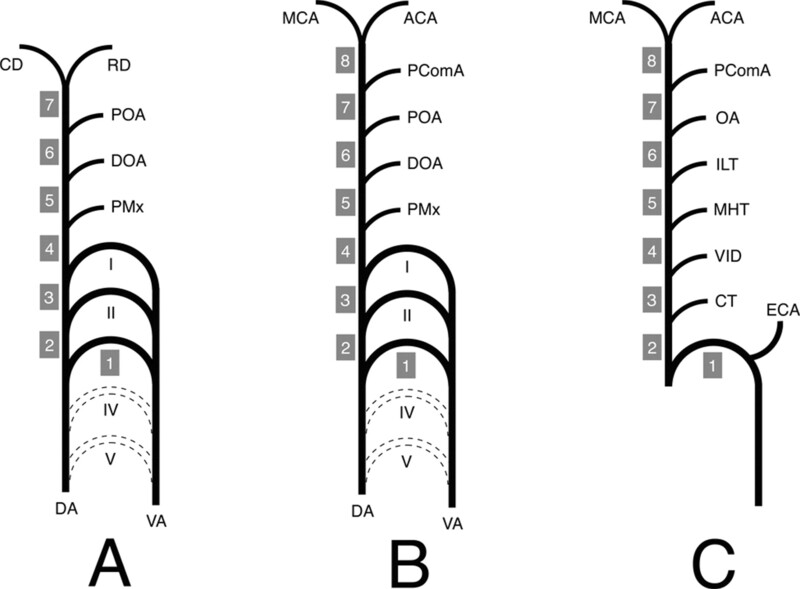 The embryologic autonomy of these segments, postulated by Lasjaunias and Santoyo-Vazquez (1), is based on the analysis of a particular type of ICA variant, the segmental ICA ageneses. A segmental agenesis is caused by the congenital absence of one or several ICA segment(s). In such a situation, the proximal ICA is absent or hypoplastic, and a small or absent ipsilateral carotid canal helps establish the congenital nature of the variant (2). Another defining characteristic of ICA embryologic segments is to lie between two embryonic vessels (1). Persistent embryonic vessels, such as the trigeminal or primitive maxillary arteries for examples, are therefore not infrequently involved as collateral flow providers in cases of segmental ICA agenesis (3, 4). On the basis of these two criteria—that is, possible isolated agenesis and delimitation by branching embryonic vessels—Lasjaunias and Santoyo-Vazquez (1) were able to define seven embryonic ICA segments. We report a case of distal segmental ICA agenesis that does not fit in this segmentation pattern and suggests the existence of a terminal eighth segment located between the posterior communicating artery (PComA) and the ICA termination. Schematic representation of the ICA segmentation. The ICA is divided into eight segments: 1) cervical, 2) ascending petrous, 3) horizontal petrous, 4) ascending cavernous, 5) horizontal cavernous, 6) clinoid, 7) ophthalmic, and 8) terminal. In the classification proposed by Lasjaunias and Santoyo-Vazquez (1), segments 7 and 8 are grouped as a single terminal segment, for a total of seven segments. In the nomenclature proposed by Fischer in 1938 (10), C1, C2, C3, C4, and C5 correspond to the segments 8, 7, 6, 5, and 4, respectively. CT, caroticotympanic artery; ECA, external carotid artery; ILT, inferolateral trunk; MHT; meningohypophyseal trunk; OA, ophthalmic artery; PcomA, posterior communicating artery; VID, vidian artery. A 53-year-old woman with no remarkable medical history was seen in the emergency department for a transient ischemic attack involving her left face and upper extremity. At admission, her general and neurologic examinations were normal. Brain CT findings were unremarkable except for asymmetrical carotid canals (Fig 2A). MR imaging and angiography suggested an anterior communicating artery (AComA) region aneurysm. Digital subtraction angiography (DSA) was performed. A 53-year-old patient with segmental agenesis of the right ICA. B, DSA image (right common carotid injection, lateral view) documenting the termination of the right ICA into the right posterior communicating artery (arrow). The right carotid bifurcation is normal and the right ICA below the agenetic segment is decreased in caliber but otherwise unremarkable. C, DSA image (right common carotid injection, anteroposterior view) showing the same as above. D, DSA image (left common carotid artery, left anterior oblique view) showing collateral flow to the right anterior circulation via a large anterior communicating artery. Note the presence of a saccular aneurysm (arrow) on the left proximal anterior cerebral artery (A1 segment). The arrowhead identifies the prominent loop of the right A1 segment that is retracted on Fig 2E. E, Intraoperative microsurgical view of the distal right ICA (arrowhead). A prominent loop of the right A1 segment (arrows) is retracted to uncover the right ICA termination. Note the absence of fibrotic connection between the ICA and the right anterior and middle cerebral arteries. The cervical, petrous, and cavernous segments of the right ICA were reduced in caliber, but were otherwise unremarkable. The paraclinoid segment of the right ICA ended into the right PComA. There was no angiographically identifiable ICA distal to the origin of the PComA. The right anterior choroidal, anterior cerebral, and middle cerebral arteries were not opacified during right carotid angiography. The right external carotid artery and the right carotid bifurcation were unremarkable, including a normal-sized right carotid bulb (Fig 2B and C). An enlarged and sinuous left ICA provided blood flow to both cerebral hemispheres. The collateral supply to the right hemisphere occurred via a large AComA. There was no visible retrograde opacification of the distal right ICA at its expected location. The proximal (A1) segment of the left anterior cerebral artery was enlarged, and a saccular aneurysm was observed in its distal third, close to the origin of the left recurrent artery of Heubner (Fig 2D). After discussion of the potential risks and benefits of the procedure, the patient decided to undergo surgical clipping of her aneurysm. Following a standard left frontosphenotemporal craniotomy, the sylvian fissure was opened, and the left middle cerebral artery was identified. The left optic nerve and the left ICA were visualized. The ICA was followed to its bifurcation into A1 and M1 branches. The left A1 segment appeared enlarged. A plexiform anastomosis of the anterior cerebral arteries was demonstrated, containing four fenestrations generating five AComA segments. The aneurysm was located on the A1 segment, proximal to the first of the AComA. The recurrent artery of Heubner originated proximal to the aneurysm, which was clipped without incident. The right A1 segment was then inspected. After a prominent forward loop, it continued posteriorly as the right MCA. 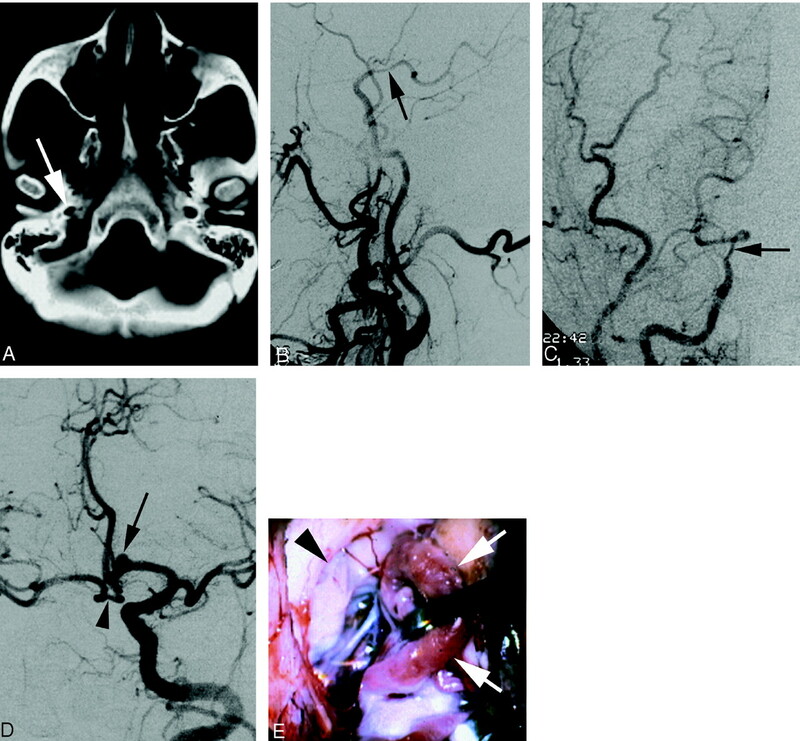 No patent vessel or fibrous residual connection was seen between the supraclinoid segment of the right ICA and the right anterior and middle cerebral arteries (Fig 2E). The distal right ICA terminated in the right PComA. A small preaneurysmal bleb was noted on the right A1 segment and was bipolar, reconstituting a regular arterial wall. An intraoperative angiogram was obtained, which confirmed obliteration of the aneurysm without compromise of parent vessel patency. The patient was neurologically intact after the surgery and was discharged after an uneventful postoperative course. Lasjaunias and Santoyo-Vazquez (1) have shown that the ICA can be viewed as a succession of embryologically distinct segments separated by the branching of a series of embryonic vessels. Each of these segments can be correlated with a specific embryonic precursor and a specific portion of the ICA in its adult configuration. All seven embryologic segments proposed by Lasjaunias and Santoyo-Vazquez are derived from the dorsal aorta (DA) with the exception of the first segment, which comes from the third aortic arch (Fig 3A). Their counterparts in the adult configuration are the cervical ICA (segment 1), the ascending petrous ICA (segment 2), the horizontal petrous ICA (segment 3), the ascending cavernous ICA (segment 4), the horizontal cavernous ICA (segment 5), the clinoid ICA (segment 6), and the terminal ICA (segment 7). The embryonic vessels separating these segments (and their adult counterparts) are between segments 2 and 3, the hyostapedial trunk (caroticotympanic artery), between segments 3 and 4, the mandibular artery (vidian artery), between segments 4 and 5, the primitive maxillary artery and the trigeminal artery (meningohypophyseal trunk, persistent trigeminal artery), between segments 5 and 6, the dorsal ophthalmic artery (inferolateral trunk)—we use here the term “dorsal ophthalmic artery” as defined by Lasjaunias et al (5), which is different from Padget’s primitive dorsal ophthalmic artery (6)—and between segments 6 and 7, the primitive ophthalmic artery (definitive ophthalmic artery). According to this segmentation, the fate of segment 7 is to divide into a rostral division and a caudal division. The rostral division is at the origin of the anterior cerebral, middle cerebral, and anterior choroidal arteries, the caudal division becomes the posterior cerebral artery, its proximal segment being later called the PComA. This is in accordance with the description made by Padget (6) of the terminal ICA embryology. Schematic representation of the ICA developmental anatomy. I, II, III, IV, and V, aortic arch I–V; ACA, anterior cerebral artery; CD, caudal division of the ICA; CT, caroticotympanic artery; DA, dorsal aorta; DOA, dorsal ophthalmic artery; ECA, external carotid artery; ILT, inferolateral trunk; MCA, middle cerebral artery; MHT, meningohypophyseal trunk; OA, ophthalmic artery; PComA, posterior communicating artery; POA, primitive ophthalmic artery; PMx, primitive maxillary artery; RD, rostral division of the ICA; VA, ventral aorta; VID, vidian artery. A, ICA embryology according to Lasjaunias and Santoyo-Vazquez (1). The ICA is constituted of seven segments separated by embryonic vessels. Segment 1 is derived for the third aortic arch, whereas all the other segments (2–7) come from the DA. The distal ICA bifurcates into the RD and CD. B, Modified ICA embryology. A new segment (8) has been added owing to reported observation. The PComA is now considered as an embryonic branch separating two segments (7 and 8) and no longer as the CD of the ICA. The ICA termination corresponds to its bifurcation into the ACA and MCA. C, Schematic representation of the adult ICA based on the developmental anatomy described above. The ICA is derived from eight embryologic segments. The segment labeling (1–8) corresponds to the labeling in Figure 1. In the reported case, absence of the ICA portion located distal to the branching of the PComA was documented by DSA and confirmed anatomically by direct surgical exploration. This finding was associated with a decreased caliber of the cervical, petrous, and cavernous segments of the ipsilateral ICA. The lack of concurrent cerebrovascular disease, such as atheromatous disease, arterial dissection, or vasculitis, suggested a congenital anomaly. This hypothesis was confirmed by the asymmetry in size of the carotid canals observed on CT scans (ie, a small right carotid canal). Surgical exploration documented the absence of connection between the distal right ICA and the right anterior and middle cerebral arteries. There was no vessel wall irregularity or residual fibrotic structure at the expected location of the missing ICA segment that would have suggested obliteration of a previously existing vascular channel. This constitutes another strong argument in favor of the congenital character of our patient’s anomaly. Therefore, in light of the clinical, angiographic, and anatomic information available, we concluded that our patient had a congenital segmental agenesis of a portion of her distal right ICA. In our patient, the missing segment was located between the PComA origin and the adult ICA bifurcation into anterior and middle cerebral arteries. (It is conceivable that the missing segment would actually be located between the PcomA and the anterior choroidal artery, which is a prominent branch in the embryo. Because the latter vessel was identified by neither angiography nor surgical exploration. However, we will consider in this report the ICA termination as the distal end of the missing segment.) According to the segmentation pattern described above, this missing portion would therefore be located distal to the seventh segment (ie, distal to the expected embryonic ICA bifurcation into its cranial and caudal divisions). Therefore, it could be considered an agenesis of the proximal portion of the cranial division of the ICA. A minor revision of the segmentation pattern proposed by Lasjaunias and Santoyo-Vazquez (1), however, allows for a coherent integration of our variant into their developmental theory of segmental ICA agenesis. This revision involves the definition of an eighth embryologic segment separated from the seventh segment by the PComA and ending at the ICA bifurcation into anterior and middle cerebral arteries (Fig 3B and C). In this configuration, the PComA is no longer regarded as being derived from the “caudal division” of the ICA, but simply as another embryonic vessel bridging the anterior and posterior cerebral circulation, comparable for that matter to the primitive trigeminal artery. The caudal ICA division is classically viewed as being at the origin of the posterior cerebral artery, its proximal portion ulteriorly becoming the PComA once a distal connection with the basilar artery is established. This concept, however, has been challenged by the study of van Overbeeke et al (7), which looked at the posterior aspect of the circle of Willis in fetuses. The authors showed that the development of the PComA is not in favor of the classic sequence described above, but rather indicates that the PComA is a bridging channel that either regresses into a small or absent PComA or stays prominent as a so-called fetal origin of the PCA. Our observation and the definition of an eighth embryologic ICA segment are in accordance with this conception of the PComA as being the most cranial of the carotid-basilar anastomoses. According to our bibliographic search, the type of ICA agenesis described here has not been reported previously. Lagarde et al (8) observed a right ICA terminating into the right posterior cerebral artery. In their case, however, surgical exploration revealed a fibrotic segment at the expected location of the distal ICA, a finding suggesting occlusion of a previously existing vascular channel rather than a true congenital agenesis. Several other cases labeled as “distal ICA agenesis” have been reported (2), but these observations do not correspond to an agenesis of the most distal segment of the ICA. In these cases, the collateral supply to the ipsilateral hemisphere was partly provided by the vertebrobasilar system via the ipsilateral PComA, an anatomic configuration that excludes the absence of the most distal portion of the ICA (ie, distal to the PComA). Aneurysms associated with ICA hypoplasia or agenesis most often occur at the anterior communicating complex, but other locations—such as the ICA siphon—have been reported (9). It is believed that the additional blood flow carried by the vessels providing collateral supply constitutes a hemodynamic risk factor leading to the development of saccular aneurysms. This mechanism may explain the presence of an atypical aneurysm in the left A1 segment in our case. In addition, our patient initially presented with a transient ischemic attack in her right MCA territory. This could be embolic in nature, the left A1 aneurysm itself representing a potential source of embolus to the right circulation. An alternative and more likely explanation, however, is an episode of hypoperfusion in the hemisphere located ipsilateral to the ICA agenesis and therefore remote from the only source of hemispheric blood supply (ie, the contralateral carotid axis). This suggests that patients with a segmental ICA agenesis may represent a group at risk for ischemic cerebrovascular disease and should be followed up accordingly. A review of the various nomenclatures that have been proposed for the ICA segmentation since the initial publication of Fischer in 1938 (10) is beyond the scope of the present report. We find interesting, however, that the addition of an eighth embryologic segment to the ICA would provide a developmental correlate to this initial and still most widely used classification. Indeed, the Fischer segments C5, C4, C3, C2, and C1 can now be equated to the embryologic segments 4, 5, 6, 7, and 8, respectively. We report a case of segmental ICA agenesis that involves a segment of the ICA located distal to the origin of the PComA. This variant can be integrated in the theory of ICA development proposed by Lasjaunias and Santoyo-Vazquez (1) only if a new embryologic ICA segment is defined. This eighth segment is located between the PComA origin and the terminal bifurcation of the ICA into anterior and middle cerebral arteries. This new developmental pattern also challenges the classic embryologic conception of a distal ICA bifurcation into rostral and caudal divisions, the latter becoming the adult PComA. Instead, the PComA can now be viewed as the most cranial of the embryonic vessels connecting the anterior and posterior circulations (ie, as one of the carotidobasilar anastomoses). In addition, our observation illustrates two possible clinical implications of a segmental ICA agenesis, a transient ischemic event in the ipsilateral cerebral hemisphere and the formation of a saccular aneurysm on the arterial pathway that serves as a provider of collateral supply. Accepted after revision December 22, 2003. Segmental agenesis of the internal carotid artery distal to the posterior communicating artery leading to the definition of a new embryologic segment.